The smell and taste senses of catfish are highly acute. So is their sense of detecting vibrations. If we took a poll, a large majority of anglers might say that they don't see well. After all, they live in muddy rivers so why would they need to see well? That's why they have highly developed senses of smell and taste to feed, right? I don't think anyone would or could argue with that. But how well do catfish see? Head out to the Great Lakes. We know that walleye anglers (and a growing number of catfish anglers) catch channel catfish on crankbaits straining the open water on portions of the Great Lakes. Smell and taste don't enter into the attraction equation here. Vibration likely does, but probably only at closer ranges. It seems that vision plays a key role, the crankbait serving as a visual attractor. I covered the topic of catfish vision in a recent article in In-Fisherman magazine, requiring me to dig through the scientific literature to find any reliable information on the physiology and function of catfish eyes. Most evidence that I found points to them as having the potential for darn good vision, probably in clear water situations, but I wouldn't put it past them for at least using minimal vision in muddy water. In fact, based on the characteristics of their eyes, I'd go out on a limb and suggest their visual acuity actually might be on par with the walleye as their eyes share similar characteristics. I might get some heat on that one, but I did say "might." Like walleye eyes, channel catfish eyes have a tapetum lucidum, a structure in their retina that can allow them to see in low-light or dark conditions with little ambient light. Also, specialized cells called cone cells in the channel catfish retina have a single visual pigment that has peak sensitivity to red wavelengths. Another group of cells, rod cells, used for seeing in low-light conditions, contains a visual pigment peaking in the green part of the spectrum. 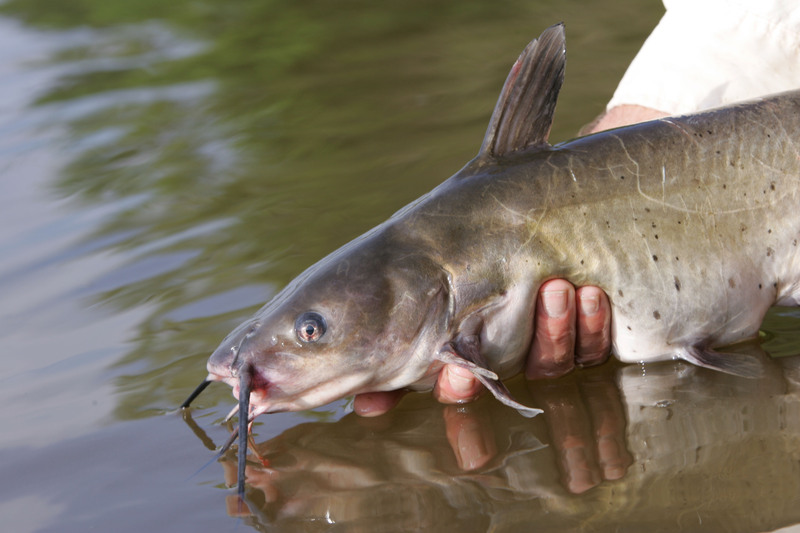 Possessing two visual pigments suggests that channel catfish might be able to possess some level of color vision. This is similar to the walleye's dual visual pigments, peaking in the red-orange and green parts of the spectrum. All too often we might think that just because a fish has a peak sensitivity to a certain color like red that we assume red is the best color to use in a presentation. But I believe things are much more complex than that. How a color contrasts with a background seems highly important. For instance, a red presentation might not be visible against a background containing a lot of red wavelengths. Coincidentally, shallow turbid waters have the greatest chance of being dominated by red wavelengths. Clearer waters have a background dominated by green or blue wavelengths. Then you have other factors like the amount of light available, sun angle, complexity of backdrops, and others. And how fish actually process all this information likely will never be known. It's all part of the puzzle of fishing. I suppose the main point here was just to cover a topic we don't know much about—good fodder for discussion. After all, we can all use a break from discussions about national debt limits and the stock market. Not much else can beat the smell and taste of a fresh chunk of baitfish for firing cats up. But what about a visual signal at times, like a flashing crankbait or spoon in specific situations? When you catch a catfish and look into its eyes, it might just be looking back. What do you think?